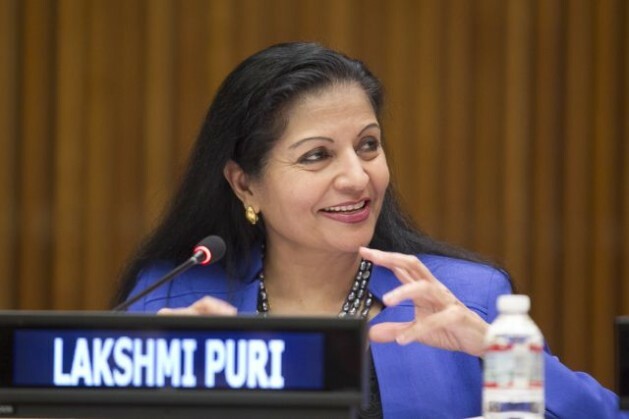 Lakshmi Puri is Assistant-Secretary-General of the United Nations and Deputy Executive Director of UN Women. UNITED NATIONS, Nov 4 2014 (IPS) - Addressing violence against women, in all of its forms, is a global imperative and should be one of the international community’s top priorities, including in forthcoming intergovernmental processes, such as the post-2015 development agenda. There are numerous international frameworks and instruments, already in existence, that define the obligation of member states to prevent and respond to violence against women. It is critical to ensure that accountability mechanisms are in place; that funding for implementation is adequate, predictable and sustainable; and that the means of implementation are strengthened. These include the 1993 Declaration on the Elimination of Violence against Women; outcomes of global conferences, in particular, the Beijing Declaration and Platform for Action and the Cairo Programme of Action; and many resolutions, agreed conclusions and statements of intergovernmental bodies, especially the General Assembly, the Commission on the Status of Women, the Commission on Human Rights and subsequently Human Rights Council, and the Commission on Crime Prevention and Criminal Justice. The Convention on the Elimination of All Forms of Discrimination against Women and the Committee’s General Recommendation 19 are also key components of this global normative framework. More recently, in 2013, at its 57th session, the Commission on the Status of Women adopted the milestone agreed conclusions on the “elimination and prevention of all forms of violence against women and girls,” which apart from representing normative progress and commitment, constitute a global plan of action. The creation of the United Nations Entity for Gender Equality and the Empowerment of Women (UN Women), with its normative support, operational and coordination functions, further demonstrates the commitment to the rights of women and the achievement to the goal of gender equality at the global level. However, the translation and full implementation of these global norms into national laws, policies, and measures remain uneven and slow. This is clear from the prevalence of all forms of violence against women seen throughout the world. The focus of prevention and response to violence against women should therefore be on strengthening the implementation of existing global policy frameworks and in ensuring accountability mechanisms are in place. We must look critically at existing global policy frameworks and instruments, and identify gaps that prevent the existing framework from achieving its expected results and ways to enhance accountability. Engaging key stakeholders such as civil society organisations as well as the public is critical in enhancing the accountability of member states but also establishing a “bottom-up” approach to addressing violence against women. This is what UN Women aims to do with the 20-year review and appraisal of the Beijing Declaration and Platform for Action (Beijing+20). The Beijing Declaration and Platform for Action identified Violence against Women as one of its 12 critical areas of concern, and the review and appraisal of the Platform for Action is a key opportunity for the international community to not only acknowledge the progress made in the past 20 years but to also assess the remaining gaps and challenges in its implementation, including violence against women, to feed the lessons learned into the post-2015 development agenda processes. UN Women has developed several good practices in engaging other stakeholders to hold member states accountable on their commitments to gender equality and the empowerment of women, in addition to our norm setting and knowledge building, and programmatic work in 81 countries. UN Women has established global, regional, and national level Civil Society Advisory Groups, has worked through the U.N. Secretary-General’s “UNiTE campaign,” and the newly established “Empowering Women, Empowering Humanity: Picture it!,” and the “HeForShe” Beijing + 20 campaigns to engage the global citizenry on ending violence against women. Moving forward, it will be crucial to continue to engage on the post-2015 processes. We are pleased to see that in the proposed Sustainable Development Goals transmitted to the General Assembly by the Open Working Group included, for the first time, ending violence against women as a target under the transformative and comprehensive goal on gender equality and the empowerment of women. However, we must continue to work to ensure that this transformative goal is supported by strong indicators to enhance the monitoring, accountability and implementation by member states in the final post-2015 development agenda. In addressing such a complex phenomenon, which is embedded in gender inequality and harmful gender stereotypes, more needs to be done, beyond the adoption of additional international instruments and national legal and policy frameworks. It is critical to ensure that accountability mechanisms are in place; that funding for implementation is adequate, predictable and sustainable; and that the means of implementation are strengthened. A revitalised global partnership and political will can make the difference in ensuring the right of women and girls to live a life free of violence. It’s sad that a discussion of one the most pervasive problems in the world draws almost no comment. I’m still having some problems publishing my book. It’s too complicated to self-publish in France (esp. re tax situation!). “Just one slap?” is a French creative non-fiction about Katya, an accountant in her thirties and mother of baby Zoe. The setting is France, but it could be pretty much anywhere in the so-called developed world. It is the story of a woman abused over four years by Eric, Zoe’s father, a doctor in his forties. Using the common story of one woman, this book guides the reader through the institutional violence of a social, political and judicial system that was too blind to see and too deaf to hear. I have approached mainstream publishers and one of them has described this book as a “very technical and documented book, with precise references and quotations of the Criminal Code, […] unquestionably a fine work around violence. It is an important and necessary text which would be more appropriately listed with specialised books offered by legal publishers” (“texte, très technique et documenté, avec des références précises et des citations du Code pénal, […] indéniablement un beau travail autour de la violence. C’est un texte important et nécessaire qui devrait trouver place dans une maison d’édition plus spécialisée dans le juridique”).